The Ivan Labs El SID circulating pumps have been the best choice for solar hot water and radiant heat for at least the past few decades. For solar hot water they are used to pump water from the solar collector(s) to the heat exchanger (or storage tank) and sometimes a second pump to pump from the heat exchanger to the hot water tank/heater if using a heat exchanger. The PV models can be connected directly to a solar module and will turn on when the sun is strong enough for your solar hot water collector(s) to collect hot water and shut off when the sun disappears behind clouds or at the end of the day eliminating the need to temperature controls. In a radiant heat application, there is usually one battery model pump used per heating loop that can be controlled separately by a separate thermostat for each loop. This eliminates the need for zone valves. As they are DC (direct current) pumps there is no need to use an inverter, making the system simple and efficient. El SIDs are maintenance free , feature a 30,000 hour life expectancy, have no bearings, no brushes and no seals to wear out. They are also very quiet making them good for installation in living areas of your home. SID is an acronym for STATIC IMPELLER DRIVEN. These pumps use an electronic pump driver that simply creates a magnetic field. There are no moving parts inside the motor and no risk of spark. A magnetic field is generated that drives the impeller without touching it. The electric driver is fastened to the pump housing with 4 Phillips head screws. It can be removed from the pump without any loss of water. We usually recommend you leave the driver off the system until the system is filled with water and there is no more risk of leaks. One last thing to consider about the driver is the fact that it is not waterproof. If water or antifreeze is allowed to contact the driver, it will likely be damaged. Everything inside the pump is corrosion proof and the brass housing is well made and machined to a fine tolerance. At each end of the housing is a 1/2″ male pipe thread. We recommend installing 1/2″ brass unions at each end of the pump to make pump removal easy if needed at a later date. All of the El SID circulation pumps will operate at temperatures up to 250o F and up to 175 psi. If you exceed 175 psi it is possible the stainless steel plate on the pump head will distort causing leakage and/or impeller contact. The PV (photovoltaic / solar direct) models are designed to operate from a solar panel, will operate at 8-20 volts and are usually used for solar hot water and solar heating applications. It is best to size the solar module 25%-50% larger than the pump’s nominal rating. 25-30 watt solar module for a 20 watt PV pump. The battery models will operate at a voltage of 8-16 volts and are most commonly used for radiant heat, aquaculture, ponds and homemade air conditioning systems. If you connect a battery model to a solar panel it will be damaged if the voltage climbs above 16 volts. The battery pump driver can also be damaged if the PV module is making power but not enough power to operate the pump. In this situation, the impeller will not be moving but still have power going into it. The driver can overheat and be damaged. The PV pump models actually have locked rotor protection built into them. If you connect a PV model to a battery, the pump will not be damaged. It will however operate at a slightly reduced capacity. TO PURCHASE AN IVAN LABS SID3.5PV PUMP CLICK HERE. The SID3.5PV is a 3.5 watt 12 volt PV (solar module) direct pump capable of circulating up to 2.0 gallons per minute of water. It operates directly from a solar module with an input voltage up to 20 volts. The SID3.5PV starts to operate at 8 volts with as little power as 1 watt. This pump is designed to be used with a 3.5 watt module for circulating water and 5 watt module for glycol. It can be wired direct to the module in a solar hot water system eliminating the need for controls. When the sun shines the SID3.5PV turns on circulating water or glycol through a hot water collector. When the sun goes down the pump turns off. It’s that simple! You may also use a 2W2DELTA/12 temperature controller for more accurate and efficient operation. The SID3.5PV is large enough to circulate a system with one 4X10 foot collector. For a system with a larger collector, multiple collectors or a volume more than 2.0 gallons per minute, a larger pump is required. TO PURCHASE AN IVAN LABS SID5PV PUMP CLICK HERE. The SID5PV is a 5 watt 12 volt PV (solar module) direct pump capable of circulating up to 2.5 gallons per minute of water. It operates directly from a solar module with an input voltage up to 20 volts. It starts to operate at 8 volts with as little power as 1 watt. This pump is designed to be used with a 3.5-5 watt module for circulating water and 5 watt module for glycol. It can be wired direct to the module in a solar hot water system eliminating the need for controls. When the sun shines the SID5PV turns on circulating water or glycol through a hot water collector. When the sun goes down the pump turns off. It’s that simple! 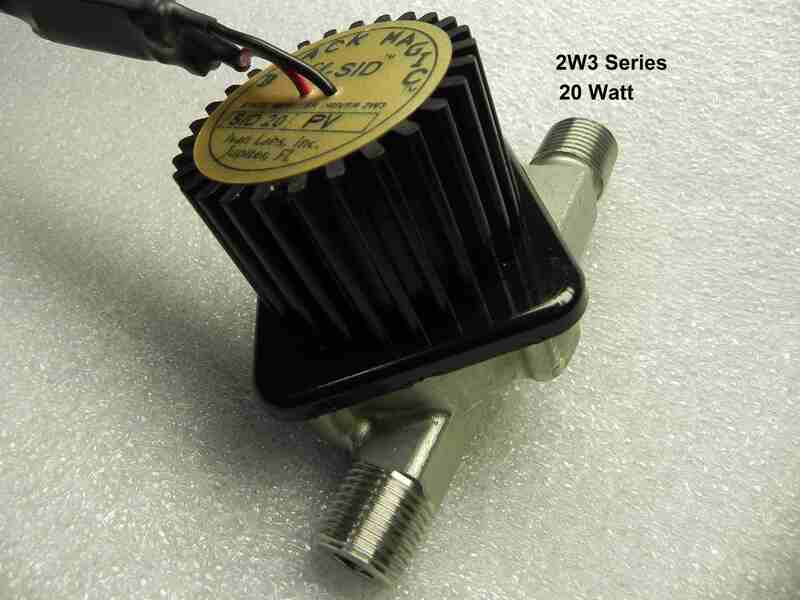 You may also use a 2W2DELTA/12 temperature controller for more accurate and efficient operation! The SID5PV is large enough to circulate water in a system with two 4X10 foot collectors using a 5 watt module. It can circulate glycol in a system with one 4X10 foot collector using a 5 watt module. For a water system with more than two collectors or volume more than 2.5 gallons per minute a larger pump is required. For a glycol system with a larger collector, multiple collectors or a volume more than 2.5 gallons per minute, a larger pump is required. TO PURCHASE AN IVAN LABS SID10PV PUMP CLICK HERE. The SID10PV is a 10 watt 12 volt PV (solar module) direct pump capable of circulating up to 3.3 gallons per minute of water. It operates directly from a solar module with an input voltage up to 20 volts. The SID10PV starts to operate at 8 volts with as little power as 1 watt. This pump is designed to be used with a 10 watt module for circulating water and 20 watt module for glycol. It can be wired direct to the module in a solar hot water system eliminating the need for controls. When the sun shines the SID10PV turns on circulating water or glycol through a hot water collector. When the sun goes down the pump turns off. It’s that simple! The SID10PV is large enough to circulate water in a system with up to three 4X10 foot collectors using a 10 watt module. It can circulate glycol in a system with up to two 4X10 foot collectors using a 20 watt module. For a water system with more than three collectors or a volume more than 3.3 gallons per minute a larger pump or multiple pumps are required. For a glycol system with more than two collectors or a volume more than 3.3 gallons per minute, a larger pump or more than one pump is required. TO PURCHASE AN IVAN LABS SID10B12 PUMP CLICK HERE. The SID10B12 is a 10 watt 12 volt DC pump capable of circulating up to 3.3 gallons per minute of water. It operates from a 12 volt battery or bank of batteries. It can also operate from an AC to DC 12 volt wall adapter. The SID10B12 can operate at 8 volts with as little power as 1 watt. This pump is designed to be used in radiant heat applications, hot water baseboard or with inside or outside hot water boilers. It uses 12 volt DC power eliminating the need for an inverter. Each SID10B12 pump only consumes 10 watts instead of the 150-200 watts a standard 120 volt circulating pump uses. You may use a 2W2DELTA/12 temperature controller for more accurate and efficient operation with your boiler or water heater. The SID10B12 is large enough to circulate 3.3 gallons per minute of water in a closed loop system such as a radiant heat or hot water baseboard system. Generally, each loop requires one pump. 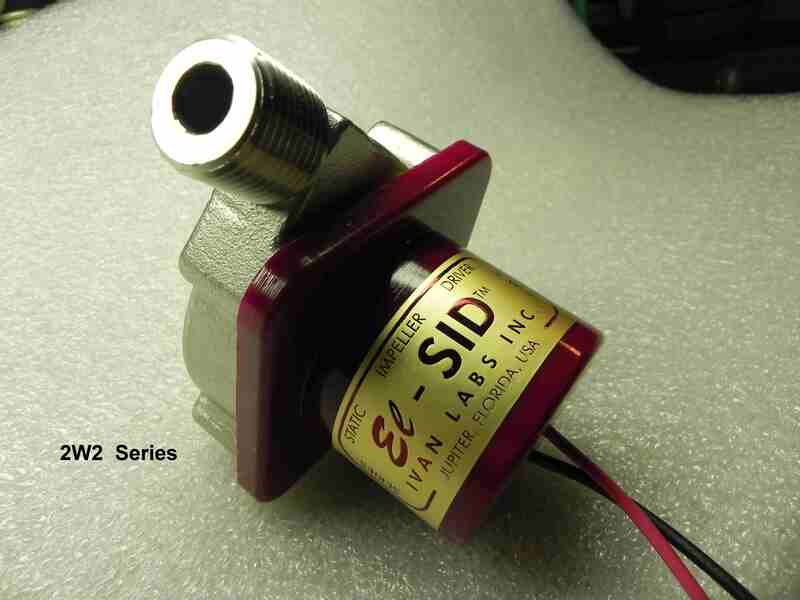 TO PURCHASE AN IVAN LABS SID10B24 PUMP CLICK HERE. Ivan Labs Inc. El Sid SID10B24 is a 10 watt 24 volt DC pump capable of circulating up to 3.3 gallons per minute of water. It operates from a 24 volt battery or bank of batteries. It can also operate from an AC to DC 24 volt wall adapter. The SID10B24 can operate at 20 volts with as little power as 1 watt. This pump is designed to be used in radiant heat applications, hot water baseboard or with inside or outside hot water boilers. It uses 24 volt DC power eliminating the need for an inverter. Each SID10B24 pump only consumes 10 watts instead of the 150-200 watts a standard 120 volt circulating pump uses. You may use a 2W2DELTA/24 temperature controller for more accurate and efficient operation with your boiler or water heater. The SID10B24 is large enough to circulate 3.3 gallons per minute of water in a closed loop system such as a radiant heat or hot water baseboard system. Generally, each loop requires one pump. TO PURCHASE AN IVAN LABS SID20PV PUMP CLICK HERE. The SID20PV is a 20 watt 12 volt PV (solar module) direct pump capable of circulating up to 6.0 gallons per minute of water. It operates directly from a solar module with an input voltage up to 20 volts. The SID20PV starts to operate at 3.1 volts with as little power as 1.1 amps. This pump is designed to be used with a 20 watt module for circulating water and 30 watt module for glycol. It can be wired direct to the module in a solar hot water system eliminating the need for controls. When the sun shines the SID20PV turns on circulating water or glycol through a hot water collector. When the sun goes down the pump turns off. It’s that simple! The SID20PV is large enough to circulate water in a system with up to four 4X10 foot collectors using a 20 watt module. It can circulate glycol in a system with up to three 4X10 foot collectors using a 30 watt module. For a water system with more than four collectors or a volume more than 6.0 gallons per minute, multiple pumps are required. For a glycol system with more than three collectors or a volume more than 6.0 gallons per minute, more than one pump is required. 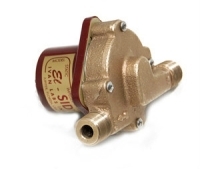 TO PURCHASE AN IVAN LABS SID20B12 PUMP CLICK HERE. The SID20B12 is a 20 watt 12 volt DC pump capable of circulating up to 6.0 gallons per minute of water. It operates from a 12 volt battery or bank of batteries. It can also operate from an AC to DC 12 volt wall adapter. The SID20B12 will begin to operate at 8 volts with as little power as 1 watt. This pump is designed to be used in radiant heat applications, hot water baseboard or with inside or outside hot water boilers. It uses 12 volt DC power eliminating the need for an inverter. Each SID20B12 pump only consumes 20 watts instead of the 150-200 watts a standard 120 volt circulating pump uses. The SID20B12 is large enough to circulate 6.0 gallons per minute of water in a closed loop system such as a radiant heat or hot water baseboard system. Generally, each loop requires one pump. I’m looking to incorporate off-grid thinking into on-grid Net Zero house. Can we hardwire Ivan Labs El Sid SID10B12 12 volt DC Circulating Pump (2W2RD30600) into a separate DC circuit in the house instead of plugging it into the wall via AC >>>DC adapter? I bought a house with a solar domestic hot water system. I get 2 lights on the Ivan pump but am not sure it is working. How can I test to see if the pump is circulating? The o-ring on the cover plate was leaking and I repaired it. The pump driver looked OK. I live in SW fl. and have never seen 4 lights on. Two lights on a SID means it is not spinning. If the impeller happens to stop _exactly_ between two magnetic poles it can sit there balanced and fail to start. Happens here maybe once every few months. If that is the case the tiniest tap on the housing will set it spinning. If the impeller is stuck to the shaft or wedged tight by the cover it can fail to ever spin. I assume you checked for free movement while replacing the seal? If you’ve never seen four lights, I’d guess the driver is damaged. They try to seal the edges of the circuit board, but the tiniest bit of water getting in there while it is running can zap it permanently. When mine fails to start, I have overheating panels in a few minutes – really obvious. I have a snap switch and a backup pump to make sure I don’t vaporize all my antifreeze. That has the side effect of “tapping” the SID rotor and making it run. You should also be able to hear it if it is running. The pump is quiet, but the water makes noise flowing. I am in the planning stage of an off-grid cottage and looking at installing in-floor radiant heat. The Ivan Labs circulating pumps don’t appear to have enough head capacity to push the water/glycol to a second floor of the cottage. Is this the case? Do you have a recommendation? I just finish building a small solar water heater for my boat. The copper tubing collector is about 4 sq ft and I Will store the hot water in my 5 gals, electric water heater. I plan to power the circulator pump with my house battery bank as this is already charged with pv. Please recommend a pump. About 11 years ago I purchased a Ivan Labs El Sid pump for my home solar hot water system and it still works, I am very happy with it but is not inexpensive. Thank you for your comment. Very cool idea to have hot water on your boat. The only pump I would highly recommend is the Ivan Labs pump. The are available at Solar Direct for about $220 US for the 10 watt battery model. Another option would be to buy the pump driver (electrical part) from Ivan Labs and I could sell you the pump housing/impeller unit for $40. I have 5 or 6 in stock and could ship it buy small packet post cheaply or expedited post if you need a tracking number. The ideal setup would be to place the tank higher than your solar collector and allow the system to thermosiphon with no pump required. As the collector heats up the hot water would rise to the top of your tank forcing the cold water back to the hot water collector. One last idea is the “March” pump brand. They actually make the bronze housing that Ivan Labs uses but their pump motors have brushes and will wear out eventually. I’m Looking for a circulating pump that I can manually operate. The Ivan Labs El Sid SID10B24 24 volt DC Circulating Pump (2W2RE31800) seems to be the one I need. I will also need a switching system a 2 pole breaker to switch on and off. Would a 2W2DELTA/24 temperature controller be able to do the switching, can I see what the specs are for this and what it looks like. Maybe a wall mounted control panel will be an option for the switching. I have made my own hot water system attached to my fire place chimney I have taken 1/2′ soft drawn pipe and wound it around the chimney. I then connected it to a heat exchanger that I installed in my hot water tank in the roof. This is a closed circuit and will operate with glycol. I want to be able to manually operate the system so that when I make fire I can put it on to heat up my hot water as well. Let me know what you think and how I could make it happen. The pump you have chosen will work just fine. I would make sure you have two pressure relief valves, one close to the stove pipe and one close to the water tank. If you were ever to have a blockage in your tubing or a failure in the temp differential sensor or you did not turn it on fast enough, the water would turn to steam, expand 1600 times and explode. The 2W2DELTA/24 would work well. I probably have some here so I will take a picture or two and try and find some specs. They basically have two temp sensors; one you put on the water tank and one you put on the stove pipe. When the stove pipe is hotter than the tank the pump turns on. Let me see what I can find and I will add it to this webpage as soon as possible. Jody I also have lots of breakers that would work for you as well. Thanks for your reply, I will definitely take your advice concerning the pressure relief valves. I have been looking around on the web and cannot find a supplier for these products in South Africa and have to resort to the local brands available here. Thanks once again for your time. I forgot to mention that Loren. March actually makes the bronze pump heads for Ivan Labs. I assumed Jim knew that but I shouldn’t have assumed. Jim, when you call Ivan Labs just tell them you only need the pump driver and not the complete unit. I have lots of the bronze pump heads but I am all out of drivers. Good to hear from you Loren. I have had this pump running for 15 years and it is running but not pumping. Is it possible to replace the impeller on them? and if so where can I buy them???? Thank you for the very informative info on El SID PV pumps (since Ivan Labs doesn’t seem to have their own website). I bought El SID 10 PV 10 Watt pump for Solar Hot Water system (Circulating between Roof Panel and storage water heater). Problem was matching PV Panel on roof to drive it. Key info you provided was that this pump will operate on 8-20 volts. Thanks. I’m looking to set up nearly the same system as Bert in my future 2-story off-grid log cabin. My plan is to have three 300′ glycol closed-loops, heated with a glycol-filled solar panel and supplemented with a Takagi tankless water heater. I’m at 8500 feet altitude so it makes sense to go with glycol in the solar panels. I looked into Radiantec’s Open/Direct system (after seeing the write-up on your site), but I read some information regarding that type of system and it’s possible cause of Legionnaire’s disease, so I’ve decided to go with the more conservative route of a separate heat exchange system. I’m planning on using Radiant Floor Company for most of the system components. My question is, since I’ll have three different 300′ zones (one of them upstairs), would the SID10B12 pump be adequate or should I upgrade to the SID20B12 to reach the second floor loop? The SID10 lists a maximum head of only 3.5 feet, but since it’s a closed system, I was under the impression that it wouldn’t matter because the SID is a sealed impeller pump. I’ll use a separate pump for each loop. Any advice? Good choice to use the EL SIDS for your heating loops. We do love the Open-Direct system but the heat exchanger will work great. I would love it if you could direct me to the website(s) that are concerned about Legionnaire’s in the Open-Direct system. I always thought Legionnaire’s was an airborne disease that formed in duct-work but I know nothing about it. As a rule of thumb we always use the 10 watt pumps for loops up to 250 feet and the 20 watt pumps for over 250 feet. I find the flow rate is too low in the 10 watt models for long loops like your 300 foot loops. By the time the hot water gets to the end of the loop, all the heat has been extracted. The last 50-100 feet of your loop never really gets heat. I hope I explained that ok. If not let me know. You are correct about the head. There is no head in a closed loop system. The pump does not have to overcome any head pressure, it just has to circulate no matter how high your building is. You will not need any zone valves, just put each pump on its own thermostat. Zone valves use electricity that you can’t spare. 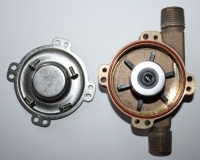 We have been using standard 120 volt AC thermostats for years without any problems. The load is so small the thermostats seem to last forever. Good luck and keep up the good work. If you have any questions you can always email me at jody@jodygraham.com. It is true your closed-system El-SID won’t see any head once it is in operation, only the loop distance and resistance from fittings matter. But be sure to plan how you will fill the system with fluid! If you’re using antifreeze you can’t just blast pressurized tap water through your loops until the air is gone. You’ll need valves that can isolate each loop from the main system, carefully located fill connection valves for each isolated loop, and a (temporary) fill pump that _can_ fight the maximum head in your system. You want to know the capacity of each loop you’re filling, so you can end up with as little extra antifreeze mixture as possible in your fill bucket once the loop is full and all the air is out of the lines. If you run the bucket dry, you’ll have to start over on exhausting the air! Shut the fill outlet, then the fill inlet, _then_ stop the fill pump. It is also nice if the fill pump can pressurize the system and preload the expansion tank with antifreeze up to your target run pressure. Even with careful air exhaustion during filling, you need an air vent at the very top of your system. And a way to add a bit of makeup fluid once that last bit of air is eliminated. Careful planning can make filling with antifreeze much less of a dreadful task. I like to use a SID10B12 as a pump for circulating how water from a tankless water heater to radiant under floor space heating. I was thinking of using a thermostat to run the pump as the temperature is below a set point, which then in turn will turn on the tankless how water heater and so hot water will be pumped through the system until the sent point temperate is reached. Is that possible, and what temperature controller would you recommend? I am totally off the grid. The SID10B12 is perfect for a radiant heat loop. We simply use a standard thermostat to turn the pump on and off as necessary. When the room gets cold the pump turns on. When the room heats up, the pump turns off. We are off the grid as well and that is why the SID10B12 is so important to us. We don’t have any extra electricity to waste. The only issue I can think off is the on demand water heater. It must be a unit that is made for radiant heat as the pressure and flow rate of your heating system are too low for a standard tank-less hot water heater. We use a condensing hot water heater (Polaris 96% efficient) here to heat our domestic hot water and our heat as it is more efficient than most tankless heaters. We used a Aquastar (79% efficient) for years and were happy with it other than the waste heat that went out the chimney. Check out our page http://solarhomestead.com/best-off-grid-heating-system/ for info on the Polaris and Open Direct Heating System. It is really different and seems like it wouldn’t work or be code approved but it really is amazing. Radiantec designed the system so I cannot take any credit for it. I’m not sure what you mean by a temperature controller unless you just mean the thermostat. We use off the shelf cheap thermostats. They have worked for years although they are not DC rated. I would usually never use an AC switch for DC but they have been great for a long time. I assume they work fine as we are only putting 12 volts at less than an amp through them. Nice info on the El-SID drivers! I’ve used them since my first active solar system, mainly because they really are _quiet_. The loudest sound is the water flowing in the pipes. Plus you can replace them or exchange them with March and possibly other drivers without opening up the wet side of your system. They’ve tried various ways of keeping water out of the circuit area, but the ones I’ve seen haven’t been effective. You’re right to warn that any wayward liquid will likely destroy your driver, especially if it is running. And you’re also right about the “locked rotor” problem. I’ve lost two now that would one start in a thousand or so fail to spin. They sit with one pair of LEDs on constantly and the other off, and apparently the magnetic field perfectly balanced against the permanent magnet rotor so it doesn’t spin. The designer blames pipe dope residue in your fluid, but I’ve used only Teflon tape forever, and been extremely careful to keep any slivers out of the fluid. And if I move a driver, the no-spin problem moves with it, it doesn’t stay with the pump rotor. The tiniest tap on the side, or a power cycle will always instantly start them spinning. Until one day they eventually burn up. The most recent one survived ten years of this, so I guess I can’t complain too much! Do you happen to know the best low-cost replacement driver source? I don’t kn0w how we missed your comment. Sorry for the delay. Your experience with the El Sid pumps seems very typical. We have used them for years in our home and shop as well as sold hundreds of them to others. We have been very pleased. Thanks for the feedback. We have used the SID10B12and SID20B12 for a few outdoor wood boilers and they have worked great. The cold will not harm the pump however we always install the pumps inside the home/cottage to keep them out of the weather. The electrical head of the SIDs canl be damaged by water. Good luck! You should never install the El Sid outside , as for the pump sticking, it is more then likely air lock. This is a small circulator and moves pressurized water only and when air builds up around the impeller you have an issue. Thanks for your comment. You are lucky to be so close to Ivan Labs if you in fact use the El Sid pumps. We agree… It is not a good idea to install the pump outside as the driver is so sensitive to water damage. About the pump sticking, air would definitely bring the system to a halt but air would not lock the pump. Loren said his pumps would stick once in a while which was confirmed by the presence of only two LEDs lit instead of four. One of the great features of the Ivan Labs pumps are the diagnostic LEDs. Thanks again for your comments. Good luck with theleveredge.com and the company that goes with it! Wow. Thanks for making a great resource for this of who want to live in the country. I have a question. Can I use the El SID for an outdoor boiler? Will the cold affect the pump?